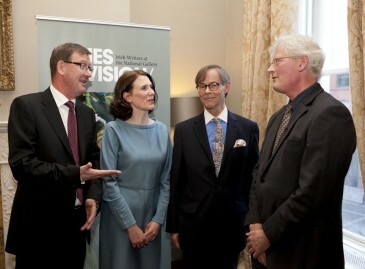 Business to Arts is delighted to continue to support Sky’s investments in emerging talent in the arts in Ireland. In 2016, Sky Academy will again award one scholarship to an artist living in ROI, aged 18 – 30. The successful recipient will receive €40,000 to go toward living costs and the development of an artistic project plus high level mentoring – giving them the time and support to develop their creative practice and take their career to the next level. Sky Academy Arts Scholarships, which is run in partnership with Hiive, will support talented emerging artists in the areas of Music, Dance, Visual Art, Theatre and Comedy, Film Production and Creative Producing. A Briefing Session in Dublin on Wednesday 13 January 2016 will guide potential applicants through the application process, giving tips and hints on how best to communicate their creative vision in the materials submitted. The briefing session will be attended by Sky Academy and Hiive representatives who will travel from the UK, as well as the Ambassador for the Irish application process, Kris Nelson, Director of Tiger Dublin Fringe, and 2015 Irish Scholarship winner, visual artist Kevin Gaffney. Kris Nelson will screen Irish applications to help create the shortlist and sit in on interviews in Dublin, and so will be able to give useful insight into how and why particular applications stood out to the panel last year. Since 2011, the Scholarships – formerly known as the Sky Arts Futures Fund – have supported twenty young artists. Each scholar receives £30,000 (€40,000) towards the development of an artistic project and living costs for one year, as well as mentoring from Sky and the Arts industry, giving access to new skills and networks. In addition, each artist receives a short film about their project and practice, and wider developmental support from Sky and Hiive. As part of the initiative, one scholarship will be awarded to an artist living in Ireland and four scholarships will be awarded to artists living in the UK. Sky Academy Arts Scholarships are open to artists aged 18 to 30 living in the UK and Ireland. Applicants need to be a member of Hiive, which is free to join, and can submit either a written or filmed application by 10 March 2016. Applications will then be assessed by industry professionals as well as individuals from Sky and Hiive, with winners announced at the South Bank Awards in June 2015.
Business to Arts and Sky Academy will host a briefing session in Dublin on 13 January for artists interested in applying. Book a place here. Zurich’s Europe, Middle East and Africa (EMEA) general insurance business is headquartered in Dublin. For some time we had been searching for an opportunity where we could support an arts-led initiative which would capture the values of our business in an innovative and imaginative way. To celebrate the 150th anniversary of the National Gallery, 56 contemporary Irish writers contributed new poems, essays and stories to Lines of Vision: Irish Writers on Art an exhibition at the National Galley which ran from October 2014 to April 2015. When we spoke to Janet McLean, Curator of the Lines of Vision exhibition – we were very struck by the concept of drawing together the great contemporary writers of today along with their chosen artworks for the Lines of Vision exhibition. In a world where the focus of many is on “the next big thing”, with every stroke of the pen, with every published work, the writer’s reputation is enhanced or diminished. They take on this mantle without the comfort of any kind of assurance of a fall-back or promise of success. And they do this day-in, day-out not for fame, honour or reward, but for the sake of their art, their profession. These are true risk takers. At Zurich, we help our customers understand and protect themselves from risks in their everyday lives. It is our mission statement. Our raison d’etre. Writers and artists take risks all of the time, it’s part of what they do. The fruits of their art are scrutinised intensely. It was this confluence of factors – the valued role of the National Gallery of Ireland in protecting great works of art, the things that we treasure, and the risks borne by artists and writers throughout their lives, for the sake of their art-form – that attracted Zurich to pledge our support for what was a truly unique exhibition. We were also attracted by the fact that in addition to hosting an exhibition, the National Gallery was, in conjunction with the exhibition, planning to commission the publication of a book of the collected works of the 56 Irish writers who had been invited to contribute, along with their chosen artwork. The Lines of Vision exhibition was also complemented by an extensive public programme of events. To accompany the exhibition the National Gallery commissioned a short film to accompany the exhibition. In short, through the innovative approach taken by the National Gallery, the Lines of Vision project utilised a range of mediums to reach a wide and diverse audience. Perhaps uniquely, long after the conclusion of the Lines of Vision exhibition, there is a lasting legacy from this exhibition and Zurich’s association with it – the book, the film, the podcasts – will all endure long after the memories have faded. Continuing on the topic of writers and books, earlier this year Zurich became the title sponsor of the Dalkey Book Festival (add link: http://www.dalkeybookfestival.org/) which ran over four days in June 2015. Looking forward to next year’s Zurich Dalkey Book Festival (16 – 19 June), the Programme of events is coming together nicely and we’re really excited about the line-up for 2016! 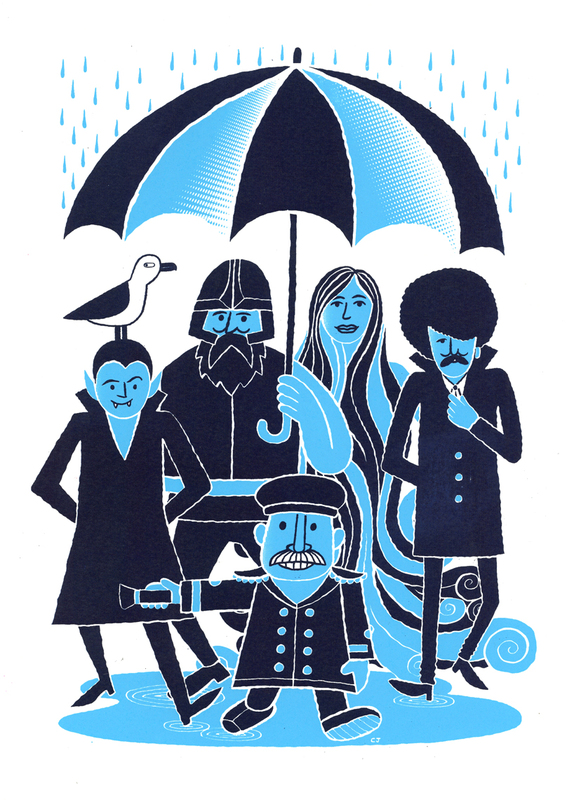 Phil Lynott, Anna-Livia, Dracula and Mr. Screen the Cinema Usher are some of the famous Dublin characters appearing in a Limited Edition Screenprint to raise money for the Dublin Docklands Arts Fund. A fun and unusual Christmas gift idea and a lively image to cheer up any room, Dublin illustrator Chris Judge has worked with us to create this quintessentially-Dublin image to raise money towards cultural activity in Dublin Docklands. The Docklands Arts Fund is being developed to support activity such as artist residencies in schools and community arts projects and events. The 2-colour A3 limited edition screenprint is created by Chris with the help of Damn Fine Print Studio and available here exclusively through Business to Arts for just €50. It was with great sadness that we learned of the death in late September of our friend of long standing, Graham Wilkinson, just days after we joined his colleagues to toast Behaviour & Attitudes’ 30th Anniversary. We first had the pleasure of engaging with Graham Wilkinson and Behaviour & Attitudes in 1992 when they joined our fledgling membership network, and they have been loyal supporters and champions since then. Graham was always quietly supporting our work, with letters on file giving us advice on the preparation of Membership Surveys over the years. Along with his wife Carol, he was a great attendee of our events, and always ready with an encouraging or appreciative word and constructive feedback on things we should consider doing. For us, Behaviour & Attitudes are most notably associated in cultural circles, for their Corporate Collection and Commissioning. During their early years, the Partners thought hard about what would make an appropriate ‘thank you’ gift for clients at the end of each year. It proved prescient (in terms of loyalty building) and ahead of its time (for gifting) to develop an annual commission of fine-art hand-made prints by leading Irish artists in traditional techniques such as lithography and etching. Adding enormously to the excitement on delivery, each year the print arrived to clients in specially designed and commissioned packaging with light-hearted copy which brought a sense of fun, engagement and added value to the work itself. The Commission project proved its worth in communicating Behaviour & Attitudes’ appreciation of their relationships with their clients; highlighted their values and the synergies of their business with the arts; and showcased talented Irish artists to a broad range of businesses and individuals. We know that the Behaviour & Attitudes Editions form the corner-stone of many private and corporate collections having kickstarted a love and interest for many. Graham worked hard to grow the B&A commission process over the years, ensuring its engagement throughout the company and nurturing the partnership with Graphic Studio Dublin who supported the project throughout, as well as nurturing many of the Artists themselves. The Series has now run for over 30 years, a worthy winner in 2003 and has been highly commended on a number of occasions at the Allianz Business to Arts Awards, winning the inaugural Jim McNaughton Perpetual Award for Best Commissioning Practice in 2008. 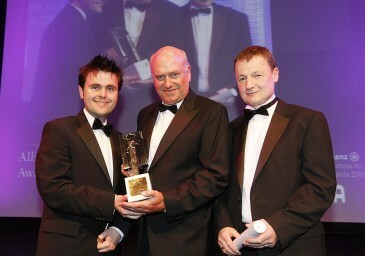 Rest in Peace Graham, you are already missed immeasurably.